Over on my YouTube Channel, I have posted a few video tutorials focusing on the built-in accessibility features of Apple Watch. I also discuss these accessibility features in more detail in my recently updated book on low vision supports for Apple users, Zoom In (available as a free download on the iBookstore). VoiceOver, Zoom and many of the accessibility features familiar to users of iOS devices are included in Apple Watch. These accessibility features ensure users with a variety of special needs can personalize and use their Apple wearables. As with iOS devices, Apple Watch also supports apps that provide even more flexibility for users in how they can use the wearable. With the release of watchOS 2 these apps can now run natively on the device itself, promising faster loading times and better performance overall. More importantly, apps can now use many of the hardware features available on Apple Watch, such as the Taptic engine, the Digital Crown, the various sensors (heart rate sensor and accelerometer) and the microphone. Basically, apps can do much more than they could with the initial release of Apple Watch, opening the door for developers to be even more creative in how they address the needs of users who have special needs. This post focuses on my favorite apps for such users. With any of the apps mentioned here, you will install the app from App Store just as you would do it for iPhone apps. You would then open the Watch app, go to My Watch, tap on the name of the app and make sure the toggle for “Show App on Apple Watch” is set to on. For some apps, you will also have an option to include it in Glances, the Apple Watch feature that allows you to access information with a swipe up from the current watch face. For your convenience, I have collected all of the resources mentioned in this post into an AppoLearning Collection. Have anything to add (apps, ideas for use in the classroom)? Let me know and I can add you as a collaborator to this collection (a new feature available on Appo Learning). Visual schedules are supports that allow children and adults with autism and related disabilities to better handle transitions in their daily routines. These schedules use pictures to indicate to learners what they are to do and where they are to go next, helping to ease anxiety around transitions and building their ability to act independently. According to developer Enuma (formerly Locomotion Apps), Visual Schedule ($12.99) is the first picture-based scheduler for the Apple Watch. On the Apple Watch, the app will display each activity as it is happening, with a progress indicator to let the learner know how much time is left before transitioning . Swiping up on any activity will display any associated tasks so that they can be checked off. Swiping to the left will then show what activities come next. Building the visual schedules themselves takes place on the paired iPhone, where most of the work is done through a drag and drop interface. From the Today view, tapping Edit in the upper right corner will display icons for 14 preset activities on the right side of the screen. You can also tap Add (+) at the bottom of the list to create your own custom activity (which can use a photo from your Camera Roll as its icon). For each activity, you can double-tap its icon in the Edit view to specify the color of the label as well as any associated tasks. To build the visual schedule itself, you drag the activity icons onto the Today view and use the provided handles to adjust the activity’s duration . Proloquo2Go ($249.99) is a robust symbol-based communication app that has been available for iOS devices for some time. The price listed is not for the Apple Watch app itself, but rather for the communication app that runs on iOS and which includes an Apple Watch component. Developer AssistiveWare originally created the Apple Watch app when the watch was announced and at that time the app only allowed the wearable to be used as a switch for a paired iPhone running Proloquo2Go. With watch OS 2, Proloquo2Go now also provides basic communication capabilities on the Apple Watch app. When you first launch Proloquo2Go on the Apple Watch you will be prompted to select the mode you want the app in: Switch or Communication. To change the mode after the initial selection, you will have to go into the Proloquo2Go options on the paired iPhone and change it there. You can see how the Switch feature works in a video I have posted on my YouTube channel. The new Communication option works by providing a basic set of phrases to start, then a Builder which can be accessed through a Force Touch to build new phrases. The Builder works very much in the same way you customize the various Complications on the Apple Watch faces. The window is divided into three cells. You use the Digital Crown to select a sentence starter from the first cell, then repeat the process to select a noun or adjective from one of the available categories to complete the phrase (again, using the Digital Crown to navigate the choices). When the sentence is selected, it is displayed upside down so that the Apple Watch can be shown to the other person. I found this to work out best when I turned off the option for “Wake Screen on Wrist Raise” on the Apple Watch settings. Otherwise, the screen would go to sleep as soon as I turned my wrist to display the message. Hopefully in the future the Apple Watch app can include text to speech, which according to AssistiveWare is a limitation imposed by Apple. Proloquo4Text ($119.99) is a text-based communication app from AssistiveWare that, like Proloquo2Go, includes an Apple Watch component. However, unlike the Proloquo2Go Apple Watch app, this one does not include a phrase builder. You can choose to store a number of phrases into a special Apple Watch folder on the iOS app, and these phrases are then available for selection on the Apple Watch. As with the phrase builder in the Proloquo2Go app, the phrases are displayed upside down when selected. For learners who have executive functioning challenges that make it difficult to stay organized, a good to do list app with reminders can be a helpful support. Surprisingly, there is no Reminders app for Apple Watch, though you can use Siri to create a new reminder that shows up on the Reminders app on a paired iPhone. Wunderlist (free) is an option if you would like to both create and view reminders on the Apple Watch. It is a free service for accessing to dos from just about any device (a full list of supported platforms is available on the Wunderlist site). On Apple Watch, the Wunderlist app provides a simple Home View with four options for viewing to dos: Inbox, Today, Starred and Surp to Me. The Glances feature is also supported so you can access your to dos for the current day with a quick swipe up from the watch face. To create a new to do item, you use the Force Touch feature of Apple Watch. You press and hold firmly to reveal the Add (+) button, then use your voice to dictate the text for the new to do and tap Done when you’re finished. On the companion iPhone app you can then add details such as the due date, set up a reminder (which will use the Taptic Engine on the Apple Watch to get your attention with a gentle tap) and organize the to dos into lists that can be accessed by scrolling with the Digital Crown on the Apple Watch. The idea is that the Apple Watch app is an interface for creating quick to dos and checking them off as they are completed, while the iPhone app provides more options for managing said to dos. Evernote (free) is one of my favorite apps for collecting random bits of information before it can get lost. It has become my replacement for all the post it notes I used to keep around my desk. With the Apple Watch app, you can create quick notes, use your voice to search through all the notes you have on your account, and see a list of recently viewed or updated notes. Like Wunderlist, Evernote supports reminders for notes that are time sensitive. However, with Evernote you can indicate the time for the reminder right on the Apple Watch itself as you create the note (though the options are limited to “this evening,” “tomorrow,” “next week” and “next month”). I find Evernote to be a nice compliment to Wunderlist and I use both: Wunderlist for to dos and Evernote for quick notes I will need to refer to at a later time but don’t necessarily have to act on right away. Together the two apps are great supports for staying organized and minimizing the risks of losing important information. day or week). Recordings can be shared with the teacher from the iCloud account the app uses to store the recordings. iTranslate (free, in-app purchase) is a nice app to have if you have English Language Learners in your class and your command of their native language is not as strong as you would like it to be. When the app launches, you can use Force Touch to change the language (more than 90 are supported). Once you have set your language, tap the middle of the screen and use your voice to speak the phrase you want translated. 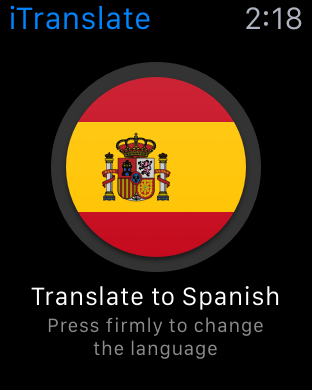 You can then play the translation back using the Apple Watch speaker. This is not the fastest app (especially at launch) but hopefully it will continue to improve on performance over time. The number of apps for Apple Watch will continue to grow as developers become more comfortable with the device. What is exciting to me is the ability for developers to tap into the hardware features of the device with watch OS 2. I look forward to how the developer community will take advantage of the microphone and I hope that soon text to speech is made available to third-party apps as well. That would make many of these apps even more useful. What do you think?